I hope he gets LOADS of wine. The internet was recently blessed with a great single-page comic titled "Hero in Action: Bottle of Wine", written and illustrated by artist Russ Heath. Heath's artwork for DC Comics' All-American Men of War #89 inspired Roy Lichtenstein's famous Whaam! painting. 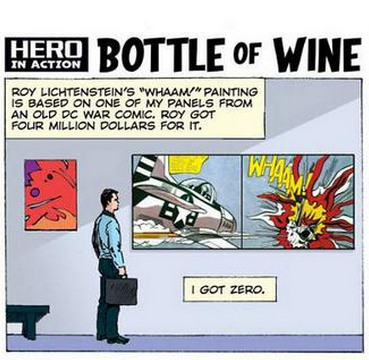 "Bottle of Wine" describes Heath's feelings about Lichtenstein's appropriation of his work*, and celebrates The Hero Initiative, a charitable organization devoted to helping comic creators in need. *Heath is impressively polite and restrained about it, too. If my work had been "borrowed" by Lichtenstein and he'd made four million dollars off of it, my version of this comic would involve a lot more profanity.